The Raeder's Raiders Spirit Award was inspired by Michigan football player J. Paul Raeder and a number of his teammates, collectively known as “Raeder’s Raiders.” They quickly became favorites of fans, teammates, and coaches because of their hard-nosed, inspired play. Time and time again, the Raiders provided a valuable spark to their entire team while coming off the bench. The award, established in 2005, is sponsored by the Raeder family to commemorate J. Paul Raeder (Football, 1957-1961), who passed away in 2004. 2019 Raeder's Raiders Spirit Award recipient, Maddy Abbott with Amy Stevens of the Letterwinners M Club and Andy Raeder. 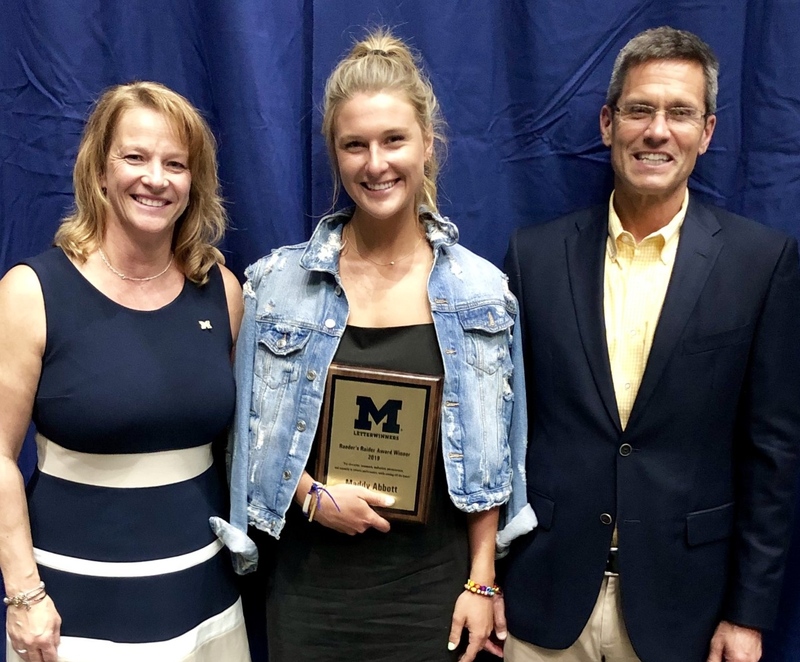 This award is presented annually by the Letterwinners M Club to the University of Michigan student-athlete who demonstrates character, teamwork, dedication, perseverance, and intensity in athletic performance, while coming off the bench. Student-athletes from all sports who have earned a varsity letter are eligible to be nominated for the Raeder’s Raiders Spirit Award by their head coach or appointed representative of the program. The nominees are voted on by the board of directors of the Letterwinners M Club. Only head coaches and their designees may nominate student-athletes for consideration of the Raeder's Raiders Award. All submissions must be made using the the official nomination form, found HERE, and received no later than March 1, 2020. Please direct any questions to the Nominations & Awards Committee of the Letterwinners M Club via email at letterwinnersmclub@umich.edu.